The history of the Morley family’s long association with harps begins in 1817 when George Morley (1790-1852) registered his harp making, tuning and repair business at 95 High St, White Chapel, London. This picture, by an unknown artist was sent to J. G. Morley. Date Unknown. 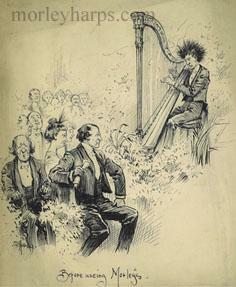 Presumably, the poor harpist had better luck with his Morley Harp! During the first part of the twentieth century John Sebastian Morley (1897-1988) – a founding member of the United Kingdom Harp Assocation – ran the harp business from premises in South Kensington (pictured below) with his wife, Cecilia Praetorius Morley, a celebrated harpist and teacher. Morleys became a home from home for world famous harpists who frequently dropped in to do business and exchange gossip. Many items in the Clive Morley Collection originate from this time. In 1968, John Sebastian retired and the Morley harp business passed to Robert Morley and Co Ltd. On the demurging of Robert Morley and Co Ltd in 1987, Clive Morley (1936-2015) moved his newly established harp business to Filkins in the Cotswolds, where it has been located ever since. In 2001 Clive was joined by his son, Ben, who officially took over the business in 2006. Today, Clive Morley Harps draws upon its long history of harp expertise to work with hand picked harp makers to provide a wide range of quality instruments to suit every budget, level of ability and interest. This is a photo of the Old London Showroom c.1900, which was at 6 Sussex Place, South Kensington, London. Marjorie Zaerr Tayloe. Harp News, Spring 1958. In the cosmopolitan part of South Kensington, London, at 56 Old Brompton Road (lately known as Sussex Place), there is a narrow Victorian shop window cluttered with old harps in various stages of unrepair, with broken strings trailing raggedly behind them. The window contrasts sharply with those of neighbouring luxurious flower and antique shops and is a never-failing source of interest to all who pass by. One enters the harp shop where scores of instruments crowd the floor space beyond the window: large Gothic harps recognisable by the hexagonal top of the pillar, smaller Grecian ones distinctive by the circular top and heavily ornamented column, harps with gaily painted decorations on their soundboards, and others looking very pathetic. A young clerk extends a warm greeting and unlocks the stairway door that leads to Mr J. George Morley’s office. At the top of the first flight of narrow steep stairs are two rooms that are also filled with harps; and the second flight up leads to the office of Mr Morley, England’s only harp maker, working like a ministering angel among still another silent company of the gilded figures! In a room which once housed the family billiard table, where the celebrated conductor, Sir Thomas Beecham, used to play a regular game with Mr Morley’s father, the present owner does his paperwork and carries on the business started in the last century by his grandfather, John Sebastian Morley. In 1816 in a small shop in Chatham, the Morley family business of harp making and harp repairing began. The company sold a variety of musical instruments and later made and marketed a large concert harp, the Morley Orchestral Harp. A few years previously, Sebastian Erard, the harp and piano maker, had designed and perfected the double-action pedal harp which was to become the model for future instruments. Harp playing then became a fashionable social asset and harps were often seen gracing Victorian drawing rooms. The sale of a harp to Her Royal Highness the Princess of Wales, is recorded in the pages of the vellum-covered account books of the harp maker, Erard, which are now in Morley’s possession. The Morley harp business flourished and moved to the more refined atmosphere of Kensington. There had been a great demand for harps from Russia, Germany and France in the Victorian period, but during World War I this export trade dwindled away. The market became so small that from then on the family gave up manufacturing harps and concentrated on the specialised work of repairing and rejuvenating them. They also continued to make the small Irish harp. These sturdy instruments are made of African mahogany and Rumanian pine, have 30 strings, and only weigh 12 pounds. They are comparatively easy to play and provide a delightful accompaniment for singing. Only a few are made at a time and they are always in demand. After World War II there was a modest revival of harp playing in Britain, particularly in Wales where the harp has always been a part of the Welsh way of life. New instruments are out of the question today, though, declares Mr Morley. A person would need from 800 to 3,000 pounds sterling to buy a new harp. This high cost is due in part to the intricate work of making the double-action harp. All the harps now in Morley’s workshop are either second-hand or brought in by their owners for repair or maintenance. Mr Morley estimates that he receives a few hundred every year. Harps do not become valuable antiques; in fact, the more modern a harp is, the higher price it can bring. Mr Morley is not perturbed about the decline of modern harps in Britain. He believes there are more than 6,000 pedal harps, most of which can be maintained in playing condition. Will the Harp Workshop die with Mr Morley, as he has no son to carry on the tradition? He hopes not. He has trained two ex-service men in the craft. Mr Morley’s library is filled with books, rare pictures, news articles features stories, concert programmes, records and personal letters from all over the world. An interesting booklet was written by his father, John George Morley, about harp teachers of the 18th, 19th and 20th centuries. Mr Morley Sr, was an expert craftsman trained by Erard and also a shrewd salesman by Victorian standards; he described himself as the “maker of the the largest harp in the world”. From 1890 to 1912 the Morleys prided themselves on having in their studio twelve to twenty harps fully strung and tuned to French Concert Pitch (420), ready for use at all times. At the top of the house are the living quarters where Mr Morley was born and has always lived. Leaving Mr Morley’s shop, one might hear a very simple tune being played by a child having a harp lesson from Mrs Morley. Through the years many famous harpists have given recitals in the Morley drawing room. Mr Morley, in addition to making, buying, selling and repairing harps, is also a gracious advisor to those beginning to play the instrument. Moreover, he is an information centre to those already playing, and in tourist season, particularly a mecca for harpists from all parts of the world.